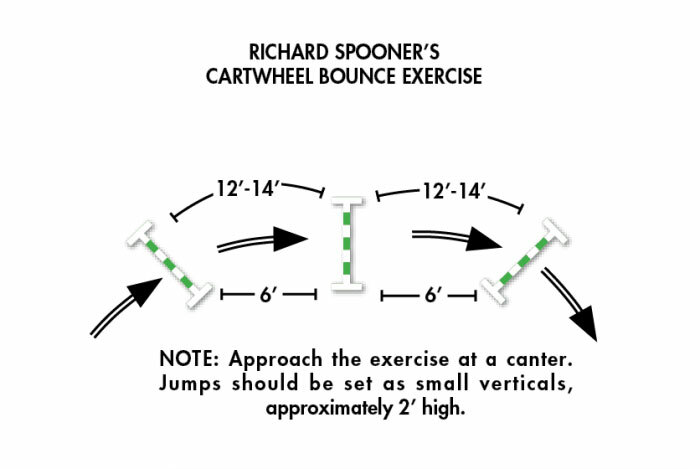 Top jumper rider Richard Spooner shares one of his favorite bounce exercises. 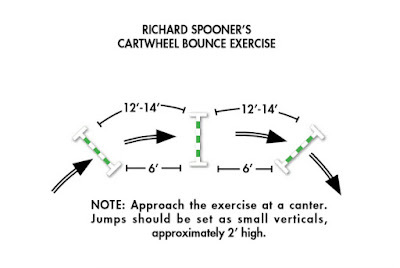 This exercise works for all levels of horses and riders and can help your horse engage his hindquarters and produce a "snappier" shoulder action. Richard Spooner and his long-time partner Cristallo on their way to winning the $50,000 Las Vegas Classic in 2016. Richard Spooner is coming in hot for the finalé of the Longines FEI World Cup™ North American West Sub-League, at HITS Coachella February 10. With a win in Las Vegas and top finishes in Sacramento, Calgary and Del Mar, he’s all set, points-wise, for springtime in Paris at the Finals. He doesn’t plan to ride his newest star, Chatinus, whose “can’t touch this” attitude has led to remarkable rounds in their six-month partnership. He’s not sure yet who he’ll ride in the Saturday showdown, but whichever horse he chooses will be familiar with a favorite gymnastic exercises: the cartwheel triple bounce. It’s a fixture in Richard and Kaylen Spooner’s home arena in the Los Angeles area’s Agua Dulce. 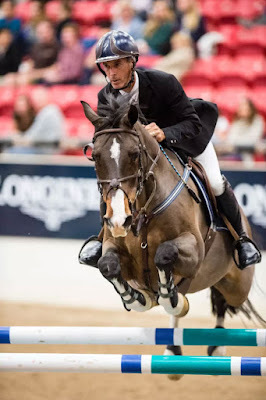 For their Grand Prix horses and prospects, its main purpose is teaching or reminding them to stay bent slightly to the inside throughout their jumping effort. The curving track requires the horse to use their hindquarters and produces snappy shoulder action. Early detection and treatment are the keys to helping a horse recover from this neurological disease. When your previously sure-footed horse starts to stumble regularly…. Or you notice his lip drooping and he’s dropping feed…. Or his gaits just seem to lack that usual smoothness under saddle…. Signs like these may be subtle, especially at first, but it is not good to overlook them. In fact, any persistent change in the way a horse uses his body---including his resting stance, his gaits, how he carries his tail, the pattern of his sweat, generalized weakness, a drooping ear or tilted head---could be a sign that he is developing a neurological disorder. And one common neurological disease affecting American horses is equine protozoal myeloencephalitis (EPM). Horses may develop EPM after ingesting feed or water contaminated with Sarcocystis neurona, a one-celled organism called a protozoan, that is spread by opossums and carried by other animals. Less commonly, a different protozoan called Neospora hughesi may also cause EPM. Most horses who encounter the organisms that cause EPM put up an immune response that fights off the infection. Sometimes, however---in less than 1 percent of exposed horses---the protozoa cross into the central nervous system and damage the brain and spinal cord. Several drug treatments are available that can curb the protozoal infection, but the damaged nerves will still require up to a year or more to heal, and some horses never recover completely. Relapses are common if the protozoal populations are able to rebound after treatment ends. A horse’s chances of a full recovery are better when treatment is started early, before the damage is too severe. The most common signs of the disease are weakness and incoordination (ataxia), primarily in the hind limbs. Often, the effects are asymmetrical---one hind leg will be affected more than the other. As the disease progresses, the horse may develop muscle atrophy. In rarer cases, if the disease affects the brain, signs may include facial paralysis, seizures, difficulty swallowing, head tilt and behavioral changes. Determining whether a horse has EPM can be difficult. Because most who are exposed to the protozoa never develop the disease, the presence of antibodies alone is not enough for a diagnosis. A horse who is positive for antibodies to one of the protozoa could still have neurological signs due to some other cause. That said, however, some of the newer testing methods---an indirect immunofluorescence antibody test (IFAT) and enzyme-linked immunosorbent assays (ELISAs)---can be used to determine the titer (the concentration of antibodies) in a blood sample. Although these types of test results are not a definitive diagnosis, many veterinarians consider a higher titer, along with neurological impairment, to be evidence of probable EPM. The most definitive type of testing looks for antibodies to the protozoa in the cerebrospinal fluid (CSF), which surrounds the brain and spinal cord. Evidence that the organisms have penetrated the central nervous system is an even clearer indication that the horse’s neurological signs are attributable to EPM. Finding high titers of anti-bodies in both the blood and the CSF is the best indication of EPM that is currently available. However, even this evidence is not considered definitive proof that the EPM is the cause of any neurological signs. And because obtaining a sample of CSF is a more technically challenging and more in- vasive procedure, many veterinarians proceed on the assumption of EPM based on the blood tests and observation of signs alone. Ponazuril (trade name Marquis) is an oral paste delivered once daily for 28 days. Diclazuril (trade name Protazil) is an alfalfa-based pellet that can be fed daily as a top dressing on a horse’s grain for 28 days. Sulfadiazine and pyrimethamine (trade name ReBalance) is an oral suspension administered daily for as long as 270 days. All of these drugs are antiprotozoal and cross the blood-brain barrier to either kill or inhibit the reproduction of the organisms within the central nervous system. The best choice for your horse depends on several factors, including which is easiest to admini-ster effectively. Your veterinarian will advise you on special handling for the drugs. For example, some evidence suggests that administering DMSO (dimethylsulfoxide) in conjunction with ponazuril may help the drug to reach therapeutic levels faster. Also, especially in more severe cases, a veterinarian may opt to begin the treatment with a “loading dose” of ponazuril, with three to seven times the normal amount, to help the drug reach the central nervous system faster. In a few cases, longer treatment periods are needed. Avoid attracting large numbers of scavengers. It is not necessary, or probably even possible, to keep all opossums away from your property. And that’s OK: Opossums eat prodigious numbers of pest species, including mice and ticks, which can also carry diseases. But you do want to keep their numbers to a minimum---and that means closing down the food sources on your farm that would attract opossums and encourage them to stick around. Keep your feed in sealed containers and clean up spills immediately. Use sturdy garbage cans with tight-fitting lids. Pick up uneaten cat and dog food at the end of each day, and clean up fallen seed under bird feeders. If you have fruit trees, pick up fallen fruit. Killing or trapping opossums won’t help---if you’re still providing food sources, more will come. Pick up animal carcasses. Opossums pick up S. neurona by scavenging carcasses of other infected animals---which can be many species, including skunks, raccoons, armadillos and cats. To reduce the risk that local opossums will get infected, remove any dead wildlife you may find on your property. Keep hay and bedding clean. Make an effort to keep any roving opossums away from your horse’s feed and bedding. Store these materials in a secured shed or loft to keep out wild animals, and dispose of any you find that has been contaminated with animal feces. Use feeders to keep hay off of the ground; check them periodically for animal wastes and clean as needed. Seal off the shelters. Clear up brush piles, which can provide shelter for wildlife, and close doors to sheds and other outbuildings, especially at night. Close off access to spaces underneath buildings, too---but first make sure you don’t already have animals in residence. You don’t want to trap them inside. Limit your horse’s stress. Horses who travel frequently and undergo the stresses of training and competing in high-intensity sports are at greater risk of developing EPM, according to a 2000 study from Ohio State University. Your veterinarian can advise you on steps to avoid overtaxing your competition horse and to keep him generally healthy. For more information, go to “On the Frontlines Against EPM” (EQUUS 451). The opossum is the definitive host for Sarcocystis neurona, meaning that the protozoa can mature and reproduce within its body. 1. The opossum excretes the parasite eggs, called oocysts, in its feces. 2. The oocysts release a secondary stage, called sporocysts, which may contaminate feed or water and be consumed by other animals. 3. The horse may ingest sporocysts. Horses are considered aberrant hosts because, so far, no evidence has been found that the protozoa complete their life cycles in horses. 4. In some cases, the protozoa may cross into the horse’s central nervous system and damage the spinal cord and/or brain, causing equine protozoal myeloencephalitis (EPM). 5. Other animals—including raccoons, skunks, cats and armadillos—may ingest the sporocysts and become intermediate hosts. 6. Once inside the intestine of an intermediate host, the sporocysts hatch and go through other life stages. Even-tually, they invade the muscle tissue and form sarcocysts, which contain parasite spores. 7. When the intermediate host dies, its carcass may be scavenged by an opossum, which ingests the sarcocysts. The parasites mature in the opossum’s intestine, and the cycle begins again. Note: The life cycle of Neospora hughesi is less understood, but it appears that horses do not have to eat infected food or water to contract it: Mares who carry the organism can pass it to their offspring during gestation. This means that EPM may be a possibility even in areas where opossums are not found. This article first appeared in the July 2017 issue of EQUUS and re-published here with permission.